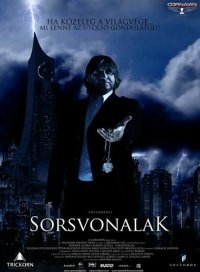 First teaser for Hungarian scifi flick SORSVONALAK is amazing! I'm seriously starting to wonder if this isn't going to be Hungary's take on The Crow or Dark City as it seems to be done with massive amounts of green screen. We've been watching this film since we found out about it back in April, and from the translated synopsis we know it's a story about a father and his invention which crosses paths with a clock factory owner, who has a sick wife, and he tries to re-write destiny. Unfortunately this short clip only highlights a little of whats in the film, but it's just enough. Check it out after the break! ok, not to sound like a hater but what exactly is "amazing" about that? You're description of the film makes it sound interesting at best but the teaser is anything but "amazing".